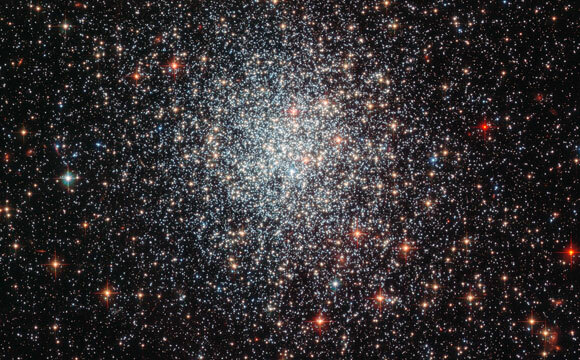 This newly released Hubble image shows globular cluster NGC 1783, which is about 160,000 light-years from Earth. 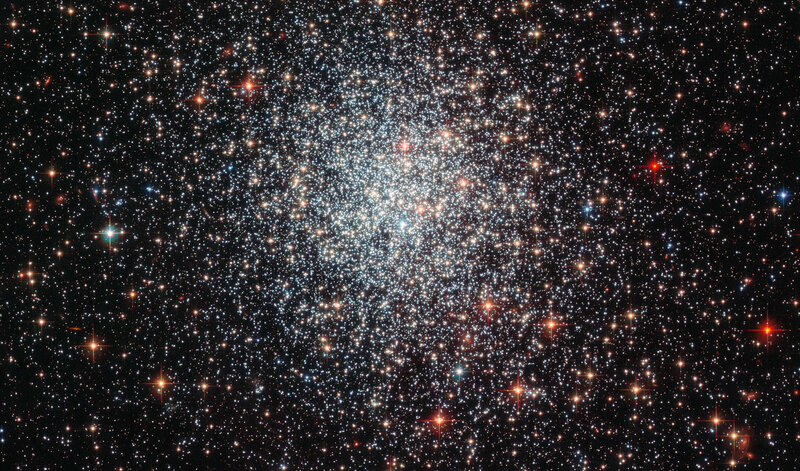 Shown here in a new image taken with the Advanced Camera for Surveys (ACS) on board the NASA/ESA Hubble Space Telescope, is the globular cluster NGC 1783. This is one of the biggest globular clusters in the Large Magellanic Cloud, a satellite galaxy of our own galaxy, the Milky Way, in the southern hemisphere constellation of Dorado. First observed by John Herschel in 1835, NGC 1783 is nearly 160,000 light-years from Earth, and has a mass around 170,000 times that of the Sun. Globular clusters are dense collections of stars held together by their own gravity, which orbit around galaxies like satellites. The image clearly shows the symmetrical shape of NGC 1783 and the concentration of stars towards the center, both typical features of globular clusters. By measuring the color and brightness of individual stars, astronomers can deduce an overall age for a cluster and a picture of its star formation history. NGC 1783 is thought to be under one and a half billion years old — which is very young for globular clusters, which are typically several billion years old. During that time, it is thought to have undergone at least two periods of star formation, separated by 50 to 100 million years. This ebb and flow of star-forming activity is an indicator of how much gas is available for star formation at any one time. When the most massive stars created in the first burst of formation explode as supernovae they blow away the gas needed to form further stars, but the gas reservoir can later be replenished by less massive stars which last longer and shed their gas less violently. After this gas flows to the dense central regions of the star cluster, a second phase of star formation can take place and once again the short-lived massive stars blow away any leftover gas. This cycle can continue a few times, at which time the remaining gas reservoir is thought to be too small to form any new stars. Be the first to comment on "Newly Released Hubble Image of Globular Cluster NGC 1783"